This past Saturday (August 15th), I got to do something I have wanted to do for a long time! I said I can finally check it off my "bucket list" of things I want to do in Lily's honor. 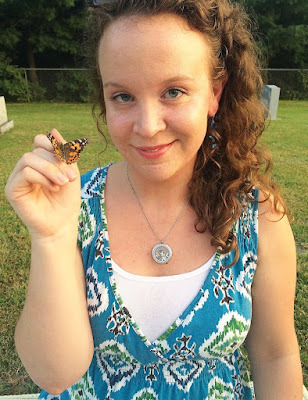 I had a butterfly release at her special spot in Virginia! We are gathered here today for a butterfly release ceremony in celebration of Lily Katherine Allen-Ball, a precious, darling little girl, who would be close to 5 1/2 years old today, starting Kindergarten this month, if she were here. Despite all my imaginings of what might have been and who she might have been, her life beyond the womb was never meant to be. If in God's plan, she was able to accomplish the purposes He had for her life from Heaven more fully than if she had grown up on Earth, then who am I to question Him? How many of us can say our entire lives have been to bring glory to God? Lily's life has been all about Jesus, without ever taking a breath or speaking a single word. I have been wanting to have a butterfly release in honor of Lily for several years. At first, I thought it would be perfect to do it on her birthday on March 16th, or on Pregnancy and Infant Loss Remembrance Day on October 15th, but then I learned that butterflies cannot be released between the months of October through March because of the colder temperatures, so obviously both those dates were not a possibility. A few months ago, my mom and I were discussing what significant date we could do a release on and we thought how special it would be to do it on August 15th. I see now that the Lord had it planned out perfectly all along. It was on this date, six years ago, in 2009, also on a Saturday, that I had an abortion appointment scheduled at Planned Parenthood. Blinded by my fear and shame, I thought I needed to "take care" of the "problem" of an unplanned pregnancy. After all, I had just turned only 20-years-old, was not married, and not in a place in my life where I thought I was ready to welcome a child into this world. It is only because of God's grace that August 15th does not hold painful memories of walking through those abortion clinic doors with my child safely nestled in my womb and walking out with her body having been violently ripped from mine. It is only because of His loving-kindness and intervention in my life that we are all standing here together, in this moment, at the beautiful memorial stone for a little girl named Lily Katherine. On the day that the enemy of our souls intended to be death for Lily day, we can rejoice that because of God's mercy that instead we celebrate Life for Lily Day! It is only because of His victory over darkness that when the clock struck midnight on August 16th six years ago that my child's heart was still beating strongly within me. I'm going to be playing three songs in just a moment. The first song was written for me by my dear friend, Heather Cofer. There is a part in the song that perfectly captures what August 15th means to me - "How close I had come to that fatal mistake, but I knew that your life was not mine to take. Through the turmoil and questions broke God's gentle voice: "will you entrust Me with this child, with this choice?" I am also going to be playing a song called, "Alive Again" by Matt Maher that I feel beautifully articulates the season in my life when the Lord broke through my darkness. The chorus of the song says, "You called and You shouted, broke through my deafness, now I'm breathing in and breathing out, I'm alive again. You shattered my darkness, washed away my blindness, Now I'm breathing in and breathing out, I'm alive again." And the other song I am going to share is called "You Are On Our Side," by Bethany Dillon. On August 6th, 2009, I wrote in my journal about how desperate I was for Jesus and how deeply I regretted choices I had made. I asked Him to fulfill His purposes in my life and to take away anything keeping me from Him. In that journal entry, I wrote the lyrics to this song. The chorus says, "You sit at the table with the wounded and the poor, You laugh and share stories with the thief and the whore. When You could just be silent and leave us here to die, still You sent Your Son for us, You are on our side." Watch the video of me sharing what you just read at the butterfly release below or by clicking HERE. I actually wrote what I was going to share and was almost finished when somehow Blogger completely deleted it the day before the butterfly release! ugh it was so frustrating. But after taking a step back and praying, I was able to remember much of what I first wrote and actually ended up more pleased with it the second time I wrote it. Watch the butterflies being released in the video below or by clicking HERE. The butterflies came in a box with a pink lily, butterfly, and pink ribbon on it, as I requested... perfect for Lily. A candle lit in her honor. I selected white and pink lilies - for purity and innocence and because she's a sweet girl. The birthday/Life for Lily Day flowers that Kala got me at the Farmer's Market. I loved decorating Lily's spot for the evening with all my butterfly items. Excited because I'm about to open the box. You can see one flying right above my head. The butterflies are so beautiful and intricate up close. It was so sweet how one stayed with me for a bit. Perfect for photos! A couple group photos. I wanted a small group of close friends and family. It meant a lot to me that my brother and sister-in-law made the trip up just for this! Visiting with loved ones after the release and soaking up the evening. I love butterflies so much that I have multiple pairs of butterfly earrings that I've gotten for myself and have been given as gifts. So, I shared a pair with my cousin, Hope, to wear at the release. Hope also wore a pretty pink skirt for Lily. And I shared a pair with Kala too. Kala wore her butterfly shirt. The sunset was gorgeous that evening! It reminded me of the evening in August 2009 when I was watching similar pink clouds dancing across the sky and I knew that I had to choose LIFE for Lily... how perfect to see a sky like this on Life for Lily Day! Love those Blue Ridge Mountains. 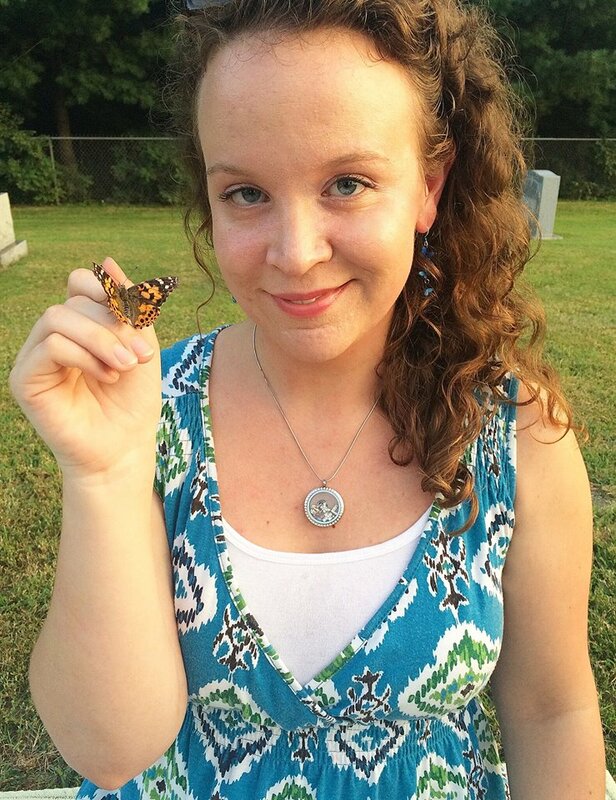 I highly recommend looking into doing a butterfly release, for those who have lost a baby and are looking for something special to do on their birthday. I was thinking it would be neat to have a butterfly release with my wedding party if I ever get married, as a way to incorporate Lily into the ceremony. The butterflies themselves, shipping, and the box or cage for the butterflies can all get rather expensive, bur I think it's worth it. I ordered 36 Painted Lady butterflies, and the company said they send around 4 extra because unfortunately sometimes the butterflies don't survive until the time of release. There were a couple butterflies that didn't make it from our release. I am wondering if I can somehow preserve them to keep, as I know many people do that with butterflies. If you are interested in having a butterfly release, I recommend the company I ordered from called A Butterfly Release Company. They are located in Florida. I had a positive experience with them and after searching online, found they have some of the best prices, though shipping is expensive. I tried to get in touch with a local butterfly farm, but they were booked and were unable to get me butterflies for August 15th, which is why I searched elsewhere. The evening turned out absolutely perfect. The Lord blessed it in every way. The weather was unusually lovely for summer, the Painted Lady butterflies were breathtaking, the company of family and friends marking the day with me meaningful, and the presence of the Lord was close. After the butterfly release, my generous grandmother treated the group of us to dinner at Crozet Pizza. Then we ended the night with stories and laughter around a bonfire. It was a day of light, joy, and thankfulness... moments that are now treasured memories.